For easy reference, you may download a printable version of this activity. The goal of this activity is to provide insight into the ways modern science views the effects of temperature on chemical reactions, including especially thermally activated processes. Schematic diagrams of the type shown below, and used in lecture, have tremendous power when thinking about such processes at the molecular level. The diagram shows the energy associated with a thermally activated process in which a chemical system transitions between two states, labeled state 1 and state 2. State 2 is a stable state because it corresponds to the lowest energy configuration. 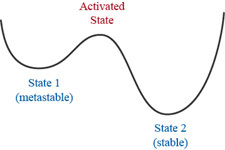 State 1 is a metastable because, although it has higher energy than state 2, the system must overcome an activation barrier to transition from state 1 to state 2. In many cases, the barrier is so high that the metastable state can exist for a very long time. For instance, diamond is a higher-energy form of carbon than graphite and so is, in principle, a metastable form of carbon. However, the barrier between the diamond and graphite form of carbon is so high that you are not in any danger of having your diamond necklace spontaneously convert into graphite. For chemical processes with lower barriers, transitions from metastable to stable states do occur and diagrams of the type above are the primary means through which scientists understand such processes. We will therefore begin by exploring the meanings of various features of the above diagram and how it is used to think about chemical processes.